As the field of embedded electronics gets more advanced, hobbyists and professionals are both in need of smaller and more powerful computers. We've been looking for awhile and now we've found one that we really like, not only because it's small and fast but because it's also Arduino shield compatible! 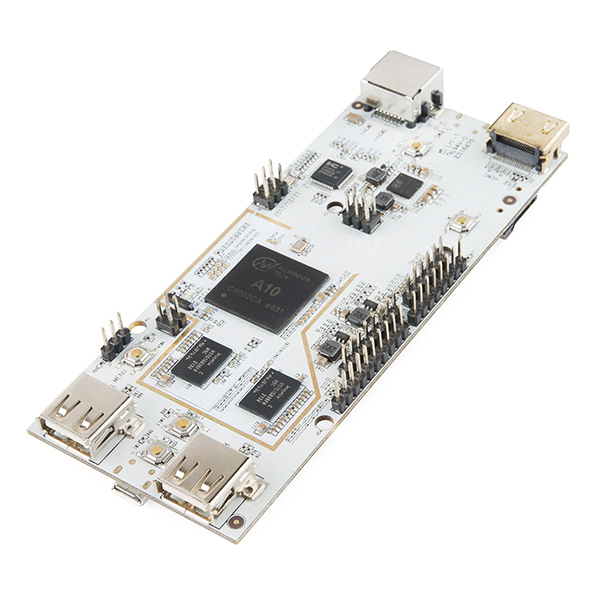 The pcDuino Lite is a high performance, cost effective mini PC platform that runs full-featured operating systems such as Ubuntu. The pcDuino Lite is a consumer grade model of our popular pcDuino Dev Board with the major difference of have less DRAM, no Android support, and no on board flash storage. It's easy to hook up, just connect 5V power and a keyboard and mouse. The pcDuino Lite outputs video to any HDMI enabled TV or monitor via the built in HDMI interface. It was specifically designed to make it easy for the open source community to develop computationally demanding projects using the vast, existing catalog of Arduino Shields. An API has been developed for the pcDuino Lite that allows the user to access all of the functions that you would expect using simple Arduino-style language. Note: Because of the limited amount of DRAM, there is no pre-installed OS, you must provide one and boot it from the SD card. Note: The pcDuino Lite has trouble connecting to certain DVI monitors. There is a fix available on the pcDuino wiki page. Check the documents below! Note: This board will be available for a limited time only. Once we run out, they will be gone! 512 Bytes DRAM? Is this missing a prefix, since it can apparently run Ubuntu still? Looks like a missing "M" prefix. Schematic shows 4x H5TQ1G83BFR which are 1Gb x 8-bit DRAM - ( (1024 x 4 ) / 8) = 512 so 512MB would make sense. What you said is correct but misleading. To be clear it's a 1Gb DRAM organized as 128M x 8. Just a suggestion: You might want to put this item on sale to help reduce the inventory before you move. Note that the Ubuntu image for the regular PCDuino doesn't seem to work on the Lite. Note also that when expanding the partition to the max size of a 16 GB micro SD card, resize2fs takes about half an hour to run. Probably correspondingly longer for a 32 GB card. So, be patient. Are you using a class 2 SD card or something? Power requirements are 2A @ 5VDC. 2 AMPS? Is that right? I'm guessing it only draws that much when it is doing heavy processing? What about standby current? I was hoping on making something portable and battery powered. I've noticed a lot of large power requirements on single board computers but I've never had a problem getting them to boot to the GUI while being powered from my PC (USB ports can output up to 500mA). Especially if you are doing lots of power intensive things I'd make sure your project supply can handle 2A, but that doesn't mean you'll actually need it. Can Sparkfun confirm the memory is indeed 512MB? Why will there be no more after these are gone? I had some serious problems with both of the Raspberry Pis I bought, but this board has outperformed the Pi in many ways. I highly recommend this as a solid, fast, and useful single-board computer.